I noticed that my workstation has been up essentially since I made my last blog post. This system also hasn’t been re-installed since November 2012. 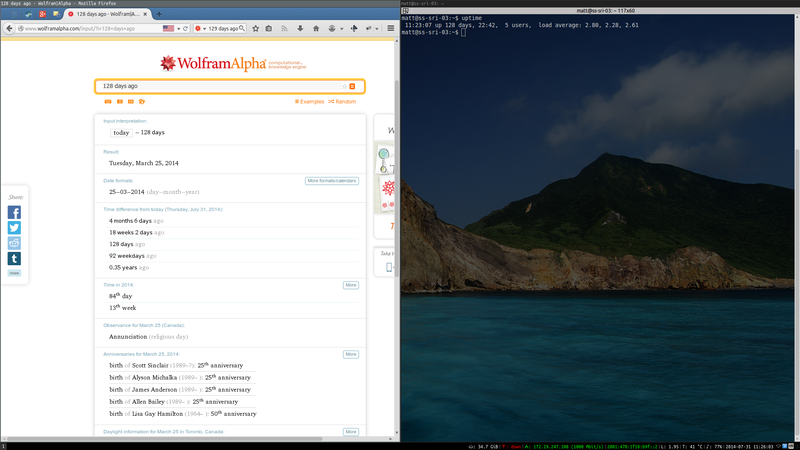 The initial install was done using the Ubuntu 12.10 “Quantal Quetzal” CD on November 20, 2012. I’ve since upgraded to every interim release – 13.04, 13.10 and now 14.04, and used a host of different desktop environments and window managers (currently using i3). The PC actually hasn’t been rebooted since installing 14.04; I only restarted X.